I feel abused... It affect my productivity and inspiration. License: CC-BY David Revoy, www.davidrevoy.com, 18 january 2016 . I've reported this to Kickstarter as well. I have reported this too. I really hope they're going to do something about it, this is outrageous. @DansLeRuSH : Merci. Je vois. Ca va être difficile. Peut-être que l'attention médiatique leur feront retrouver mon rapport plus rapidements. @cat4rent : I hope too! thank you for your time on it. Done (I've reported the project to the KS), although, it seems author do specified you as original "art and story author", lol. Salut David, j'ai signalé ça sur Kickstarter comme revente du travail d'autrui (je n'ai pas noté le terme exact, désolé) en mettant un lien vers ton screenshot. Ne laisse pas miner par ça même s'il faut bien entendu rester ferme vis-à-vis de cet abus. Reported to Kickstarter, and sent message to Ricky. Stay strong David! Love both your comic and your openness to sharing — when people don't try to rip you off. @Pat David : Thank you Pat David for the link and for the report. @mva : Thank you. Yes, sad. @Demi : This will help a lot, thank you for writing it in the comment of this Kickstarter campaign. Sorry if the promise of a printed copy will be removed. I'm right now discussing with the Krita Foundation and Blender Foundation for a printed version with all benefit going to only free software I'm using ( from Linux system Ubuntu and Mint to Krita, Gmic, Inkscape Gimp, Mypaint, smaller projects to, as percent ). @Frémo : Merci pour le soutient et le signalement! Je vais essayer de rester zen et reprendre la prod du future épisode 14. @barefootguru : Thank you, and thanks for your encouragements and nice words. I did not read anything on the Kickstarter that made me think that there was an "endorsement". Furthermore, on your own 'philosophy' page you state that "You just need to credit my name - David Revoy - as the author." That has been done. If you want a more restrictive license, I suggest you use it. This seems to be a fair and interesting use of CC-By to me. @neomonkeus : Yes. I had already trouble with this Kickstarter creator about the previous kickstarter. I pretended that was 'sort of right' after a fix and decided to not really look at it further. I feel guilty now about it of being OK with this first Kickstarter even if it was borderline with the rules. ( you can read all previous story about it here : http://www.peppercarrot.com/article280/ninjaknightcomics-publishing-kickstarter ). @Ron : I understand the possible confusion about Philosophy page. It was written in a time were I was working alone on Pepper&Carrot. Nowaday, I have a team of corrector and translator and they deserve to be credited too. It has to be fixed. It will not be instant fix because the website is translated into many langages. The license https://creativecommons.org/licenses/by/4.0/ is short, and explain really well a set of rules. Also, I recommended personnaly in a email discution to Sir Ricky McGentleman how to make a page that please the license, and I had no feedback about it. I sympathize with you Mr. Revoy! I think McGentleman is taking advantage of artists who do not speak English fluently. He has a lot of Kickstarters that look similar. But, please consider changing your Creative Commons license. It gives the impression that anyone may use your work to profit themselves, and what constitutes "attribution" is vague. You will only continue to have misunderstandings at this rate. Hi David, I just posted this to Diaspora (the only social network I use), good luck with this and wish you this to happen as few as possible! @Vivek Gite : Thank you for the repost on Reddit! @Anna : Thank you for the nice message. I understand. I need to explain the CC-By better. But in this case the author of the kickstarter is playing borderline with the rules to cheat. It's hard. @ellvis : Thank you for the repost on Diaspora! Bon courage pour ce mauvais moment. Et même s’il faisait simplement proprement le boulot d’attribuer la bonne licence, c’est de toute façon pas très sympa de ne même pas noter quelque part qu’on peut te supporter sur patreon. Apparemment il y a des gens qui se plaignent de n’avoir rien reçu de bien correct pour la campagne précédente, ça sent l’arnaque à plein nez son truc… Étonnant qu’il ait eu autant de monde en si peu de jours. J’espère que le bruit fera au moins suffisamment le buzz pour t’apporter d’autres soutiens sur patreon ou tipeee. Je pense que c’est sur ça qu’il faut insister : si vous voulez vraiment soutenir l’auteur, il y a moyen de le faire, tout est prêt ! Your grudging endorsement of the previous kickstarter this guy has run for Pepper and Carrot: http://www.peppercarrot.com/fr/article280/ninjaknightcomics-publishing-kickstarter might have given him the idea that you were ok with him doing this. Would you be able to share more of your side of the story about that particular Kickstarter? @moozaad I just did some research on exactly that. My reading of this is that "Sir Ricky McGentlemen" is setting up Kickstarters then trying to get the permission or approval of the authors. Not exactly a nice way to go about it, and in this case, he's made some factual and license compliance issues which make the entire thing very dubious. So i tried to understand how this might happened. And apart of the attribution for the translation i found a possible answer for the discrepancy between version 3.0 and 4.0 of the license. On your website you link to version 4.0 so no mistakes can be made there. So if we imagine that this person started by looking at the early episodes we can presume that he might overlooked the change of license later on. This does not excuse the lack of communication or lack of attribution for the translator(s), but it is a reasonable assumption. Please correct me if i am wrong, but shouldn't you mention that Pepper and Carrot is in fact licenses CC-BY 3.0 and CC-BY 4.0 depending on the episodes? Or how does this work for combined works with different CC versions? I have reported this too. I hope it works, as the selection seems to vanish when reloading the website of the Kickstarter campaign. That's lousy behaviour, especially his failure to communicate with you David. That says it all. He just wants to exploit the free culture movement and not be part of it. It would be worth considering that a license should require explicit up-front statements that a creator has not endorsed the usage. Anyway I'm sorry you're going through it, again, when you have approached this is such a spirit of openness and generosity. He didn't have to do anything but abide by the license conditions to take in his un-deserved profits, and I'm sure many backers assume this is an endorsed project whether or not it says so. I hope his project gets taken down on his failure to cite the right license and acknowledge all creators. I saw a comment on the kickstarter linking here. I feel bad I backed the first one but I was under the impression you'd approved (because of the other post) and it was OK. I was not planning on backing it because I was disappointed in printing quality of the book. I think if you were involved it would have been printed better. I've seen many times that "publishers" don't understand how to format art correctly. Yes, filing a DMCA report is the best thing to do (David has to do this, not anyone else). Reported on kickstarter. I Hope the issue get sorted soon. Yup, you want to file a DMCA takedown notice. The "Report" link doesn't do that. If that doesn't work, contact Jonathon Bailey <jonathan@plagiarismtoday.com>. His business is handling this kind of thing. But it is a business for him, so he may bill you. I was also mistaken that you were okay with it and was a backer of the old one, I'd much rather support you or a charity of your choosing for a better book. Message sent, commented (on the original) and reported. Stay strong David. You're doing great things for the open internet! David I've spread the word, and went to Kickstarter. It looks like some changes have been made, i.e. mentioning that you don't endorse this, proper link to cc by 4.0, mention that the artwork has been edited, and recognition of the English translator on the pictures anyway. This is what he should have done in the first place of course. Is your goal to get this canceled still? It is easy for him to comply now that he has met his goal. This clearly violates the non-endorsement clause in the CC BY 4.0 license and the attribution requirements. Besides, it is also an unethical thing to sell prints of an entire comic series for profit, without at least contacting the creator first. Even if that were legal, I would be shocked by it, and it is also contrary to the spirit of Kickstarter. By the way, your plan to publish an official printed version with profits going to you and the open-source projects used seems great to me! >> Would you be able to share more of your side of the story about that particular Kickstarter? Thanks for your research. Yes, you are right about the situation. I have to summarize the full story : At the first Kickstater ( Mai 2015 ), I knew the situation a bit before launch then I discovered the page a bit late ( the thing was already 'staff pick' on Kickstarter ), but I wasn't confident enough to bring attention to this. Pepper&Carrot project was still very young, not my main job and I was more in the spirit "bah .... It's not that important, and being 'staff pick' on kickstarter is still a cool advertisement for my growing project". Yes, I was surprised Pepper&Carrot could make a little success on Kickstarter. So, I had very mixed feeling, and it was hard to think clearly. The original page made by MrGentleman didn't had any attribution at all and was *very* infringing. We had email about it, and I had to treat him to fix the page. He did a sort of half-fix, blury communication, and I sort of pretended I was 'happy' with it. That's what you could read on your research about the first Kickstarter campaign. When two weeks ago, MrGentleman sent me an email about starting "Pepper&Carrot volume 2 on Kickstarter" . I was a bit more confident : I sent him a long email with all recommendations to this time stick to the CC-By 4.0. Because I had regret about the first campaign. I was firm on all recommendation to establish a real project compliant with the license. I wanted to be proud of this and fix the problems met on the first Kickstater ... In the result , he just posted a copy/paste of the first campaign, almost not modified. A facepalm situation. So, I decided he was making fun of me, not respecting the project and reported the page to Kickstarter ( filling a full DMCA ). After a couple of days, I stil had no answers. The situation was really frustrating to me as I was running on the same situation from the first campaign. That's why I decided to write this post to at least prevent the incoming traffic from Kickstarter about the situation. I receive patronage from NKcomic. ( Sir MrGentleman pretends to be from NKcomic , but I can't proove, email don't match ) To be full transparent: 20$ per episode , 220$ sponsored so far. Why using a fake name on Kickstater? Why it's not the NinjaKnight website linked in his profile? Why http://www.ninjaknightcomics.com/ website is not mentioning Pepper&Carrot after a full year ? And even if he is NKcomic ; it's very false to believe patronage gives him special privilege to bypass the license of Pepper&Carrot, or pretends endorsement. Here I have nothing to hide. It seems he made small changes to the wording of the page. In the comment section he now claims, that he has resolved the issues with you. That doesn't seem likely to me since he didn't address your main critique points, but it could fool people just looking on the comments section. >> It seems he made small changes to the wording of the page. Thanks you for your report Arne, Yes, he started editing the page. Things are moving now and his page should be soon compatible with the CC-By license. >> I feel bad I backed the first one [...] I was disappointed in printing quality of the book. Thank you for confirming this, and no problem for backing the first one. I didn't backed it myself, and wasn't a part of it so I never knew the about the quality. Feel free to send photos about the final product. Thank you. 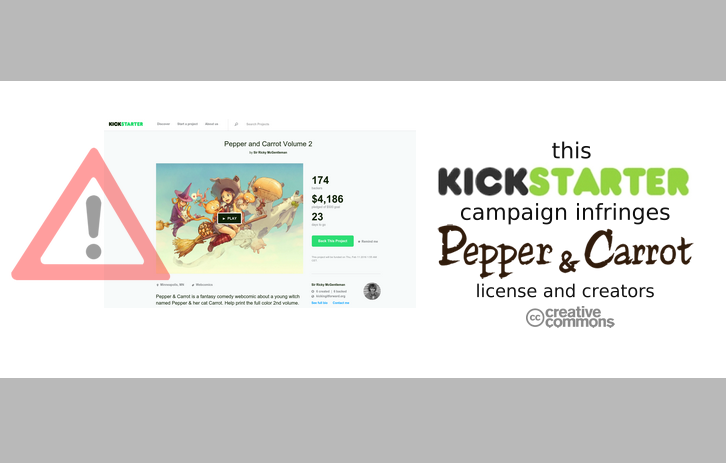 Somewhere in the last hour / half an hour the Kickstarter acted and the project page is now replaced with "Pepper and Carrot Volume 2 is the subject of an intellectual property dispute and is currently unavailable. If you are interested in this project, please check back later. Thanks for your patience." >> [Sir Ricky McGentleman about 4 hours ago ] We also contact the Kickstarter staff and made the changes they recommend have been made as well. Thank you kindly. I sent an email with adjustment. The page will be compatible only after this minor last remaining changes. Good to see you are answering my email now and start to respect my recommendation. Should I need **each time** to treat you to get your project compliant with CC-By ?! Adjust the page, and I'll close the story. You still need to fix : "English trasnslation by Mike King." on the first picture should be "English translation by Amireeti"
https://wiki.creativecommons.org/wiki/B … d_slightly ) Also, you still not introduce yourself, ( eg. " Hi, my name is Sir Ricky McGentleman , and I'm part of NKComic. We are a group of editor, publisher, and printer by an independent publishers." ) : It's important for the audience to know who you are and helps to figure what type of Kickstarter project you offer. If by 'We' you refer to NinjaKnightComic , I received this : 20$ per episode , 220$ sponsored so far ( with all month ) via Patreon. It's from another email than your. http://www.ninjaknightcomics.com/ do not mention Pepper&Carrot, NinjaKnight comic on Kickstarter is a deleted account. ( https://www.kickstarter.com/projects/56 … reator_bio ). Admit the situation is fishy and don't feel honest. Patreon is not a royalty system in disguise; I don't receive on it a percent from your Kickstarter project and I'm not interested to receive it because it's not about the money, and your business is dirty and I have testimony your product is bad quality now. I'm not interested to get Pepper&Carrot printed by you. I never asked for you for patronage. NinjaKnightComic did it spontaneously way before the first Kickstarter campaign and I was happy about it. Claiming afterward it's a royalty in desguise is plain wrong. Being a patron of Pepper&Carrot don't give you right to bypass the Creative Commons license. **You are not owning Pepper&Carrot right because you patron me** and because I'm receiving patronage is not a proof I'm associated or I endorse your project. I don't normally do this at all, but you're one of the artist I respected for many years, I went out of my way to email Kickstarter and report the project to have it taken down. Reselling your work without your consent is unacceptable. @GuyFromKickstarter : Thank you. Thank you a lot for taking action and your nice words. They mean a lot to me right now in this problem. I wrote to Kickstarter as well. I'm a backer of many projects and I pointed out to them that this project hurts their credibility as crowdfunding platform. I believe that the more emails they get the more they will feel motivated to act. @Remo Dentato : Thank you Remo for taking action. Yes, Kickstarter and all the open-sources projects, artist and creators have a long win-win common history. It would be sad to see them becoming a polluted crowdfunding platform. I also don't want to see shadows on Kickstarter brand. reported as well. this should not happen. It looks like he is fully compliant with CC-BY, plus has ceded to many of your demands that are beyond that license... If you want to prevent this, you should probably release under CC-BY-NC (noncommercial version), or honestly a non-CC license. @Frank O : I disagree. Can you quote 'the actions' I do to violate the CC-By in your opinion ? Never too late to fix them. Thank you. Reported this - I will also post this to my networks. I'm a huge supporter of Creative Commons works, but I'm thoroughly disgusted to see people try to profit off of work that is not their own. @David Revoy, thanks for clearing that up! I'll comment further on your new post. @David REVOY : You're attempting to limit what appears to be an entirely legitimate use of CC-BY. Perhaps there was a worse version before I saw it, but when I saw that kickstarter for the first time, it stated who did the art and did not expressly say anything about the artist's involvement. Why don't you release under a less-free license? @Frank O : Yes, the version you saw was almost compliant with the CC-By (already edited by the author of the page after the public exposure). Kickstarter was puting pressure on the author to fix the page, but he already had a full week of exposure with very infringing presentation, and 180 backers misinformed. The first version clearly was an attempt to steal my identity, Backers were supporting the page to support 'me' and 'Pepper&Carrot' as an artist proposing his creation, and were not informed they supported 'him' as a publisher doing stuff with a free ressources. He was also breaking Kickstarter rules, had already an old account closed, not using real name, etc... So, a lot of issue on multiple levels and true ; the fight was extended to many field, not only the one about the respect of the Creative Commons Attribution 4.0 International. I'll not change my CC-By usage. I'm fine with it, I like it, and from Sintel to Chaos&Evolutions to Pepper&Carrot , I'm strong of years of managing it and knowing my right with it. If you read it https://creativecommons.org/licenses/by/4.0/ , you'll see it already tries to prevent this type of 'endorsement' issue. You can see here more than 10 other community projects made with this license : http://www.peppercarrot.com/en/categorie4/derivations . As I told before ; in this case, the problem was not the license, but was the guy. I'm also preparing a french printed version right now for the french libraries with a publisher, and all work really smooth. I hope this answer to your doubts about my actions.